This database provides specimen records, images and other information about the ants of New Guinea and surrounding regions. Our goal is to facilitate access to contemporary and historic collections of Melanesian ants and provide resources for research of their taxonomy and ecology. The material and data displayed here represents both described and undescribed species. New specimens are gradually updated as new material from ongoing projects is processed. The Ants of New Guinea are linked with databases AntWiki, AntCat, AntWeb and Barcodes of Life. The latest online checklist available at AntWiki. 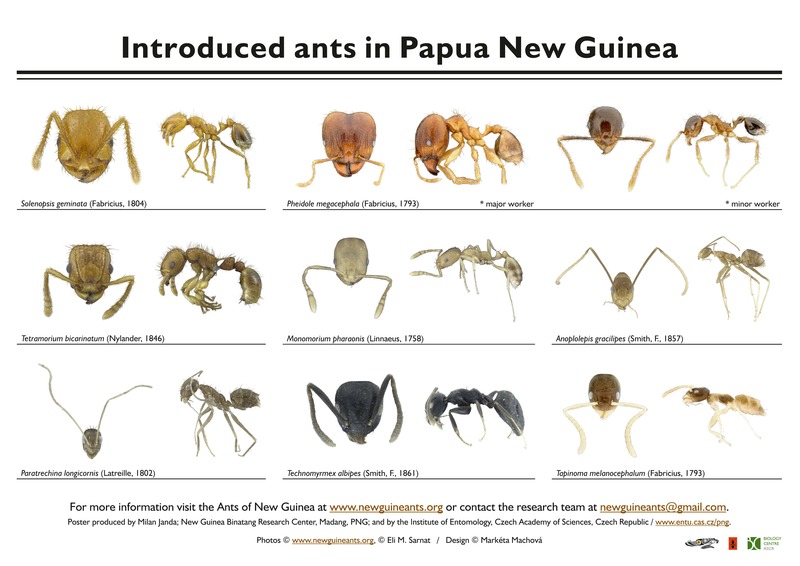 The Ants of New Guinea project was funded by grants from the Czech Science Foundation (P505/12/2467) and Marie Curie Fellowship (PIOFGA2009-25448). Disclaimer: Disclaimer: Use of this web site and information available from it is subject to our Attribution-Non Commercial Creative Commons License 3.0. For non-commercial use of images, photographs must be attributed to the original photographer and to the 'Ants of New Guinea' website.